1. Tomorrow night I get to perform Candlelight Carol with the parish choir at midnight mass. I've done this in the past and it really is a lovely piece. It's just that it's in E flat major and by the time I play it will be almost 1 a.m. - and that all makes me a little nervous. Nonetheless, when I practiced with the choir a week ago I only had one bad note so most of it came back to me! I'm also playing my flute with the organ and the choir for the Hallelujah Chorus for the very first time and I am super excited about that! During the winter of 2001-2002, an archeological team working in downtown Akron, OhioÂ’s Lock 3 Park, unearthed a small ceramic figurine. It is a curious little man with a sweet face and long white beard, wearing a blue hooded coat. When thoroughly cleaned and examined they discovered this was Santa Â– the first and original Â– the real Santa. Graham estimates the figurine was manufactured in the mid-1890s, making it the first figurine of an American Santa and likely the oldest three-dimensional representation of Santa in existence.The figurine was thought at first, by some, to be a wizard or gnome, but in-depth research over the following seven years proved the Blue Santa is the real Santa. Then the Coca Cola family turned Santa's suit red and the little blue Akron Santa Claus was mostly forgotten. 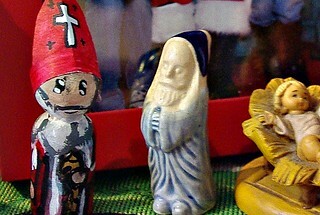 In 2007 representatives of The American Toy Marble Museum began making authentic reproductions of the Blue Santa, using the same ceramic techniques used in the mid-1890s at American Marble & Toy Manufacturing Company. That Christmas season, sales were astounding. Additional elves were hired, production increased to thousands per week, and yet demand was still so high they had to limit customersÂ’ purchases to three per sale. By hiring additional elves and working with Akron area workshops who hire disabled persons, production now continues year round. There is something uniquely wonderful and loving about the Blue Santa that has touched the hearts of all who see him. If you would like to own a Blue Santa of your own, you can get one here, on-line. If you wish to view the original in person, heÂ’s still there at his birthplace, he hasnÂ’t left. But heÂ’s now in a beautiful display case at The American Toy Marble Museum in Lock 3 Park, Akron, Ohio Â– the original North Pole. So when I heard the story I bought two of these little guys - one as a gift, and one to add to my Santa collection. You can read more about the Santa Story here. If you'd like one, go here! 3. I have been to two concerts this year that have done something to me emotionally - The first was a wonderful concert by Eric Genuis with piano and strings. The second was a surprise flute and piano concert at church this past Tuesday by two gentlemen from St. Mary's in Hudson, OH. They were wonderful. Both concerts were beautiful and even emotional. Then of course our Parish Choir had Lessons and Carols last week which was also beautiful and it just inspired me!! I have got to try harder to put myself out there and play some more music! I guess I need to set some goals and have some dreams and not rest on past laurels. It's nice to play for church every week, but there is more interesting and inspiring music than what is provided for in the Gather book! I intend to find it! and I intend to find more opportunities to play!! 4. I should mention that 3-year-old Miss C was with me at the flute and piano concert. 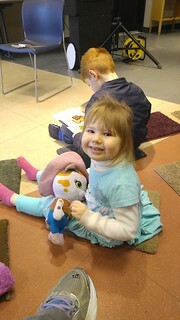 Then yesterday she went to a magic show at the library. For 3 years old, she is exceptionally well mannered at these programs. She sits still and just watches intently. I would confidently take her in any public place and know that she would behave herself! 5. Rosie made this cute craft for her piano teacher. We bought some tiles and then took some old music and cut them to fit. We burned the edges to make them more antique then Mod Podged them to the tiles. Mr. Pete then covered them with a clear spray and we hot glued felt to the bottoms. 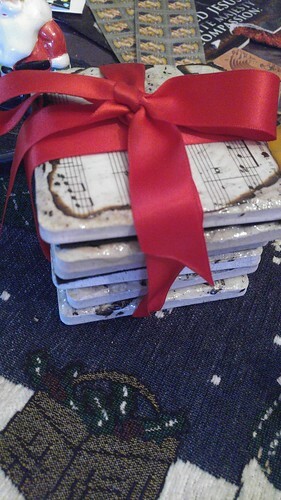 Now they are great little coasters, or I suppose you could even put something warm on them! Plus it was fun to make. 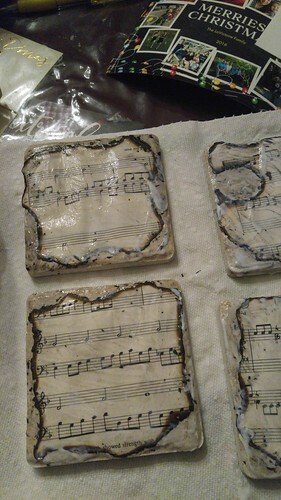 When I looked for the music to use in this craft I originally thought of just printing something off but I didn't know if the toner would smear with the Mod Podge, so I found an old music book of my Mom's. She bought it in 1989 for $2.50 - so I checked eBay to make sure I wasn't tearing up a valuable treasure - it seems that this particular book had doubled in price! It was now going for $5.00. So I felt okay about tearing out a few pages. 6. We have prayed the antiphons at Vespers every day and enjoyed the food that went with them. 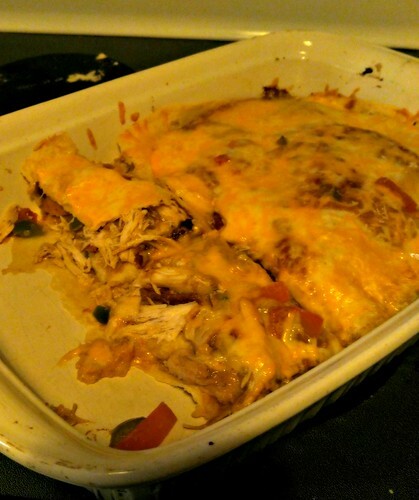 Here is our King Casserole from last night. 7. 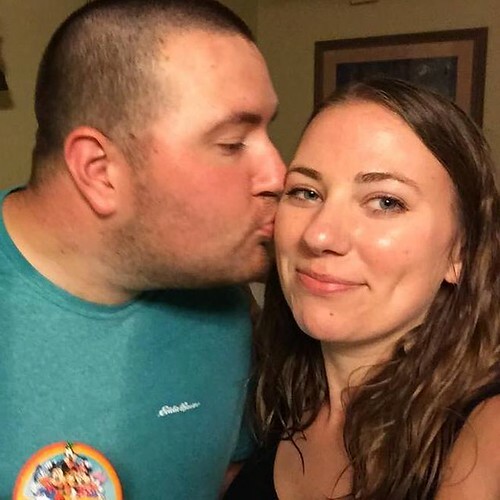 Calvin and Sarah are on their way home for the holidays! The best Christmas Present of all! !